A lot of people are making the switch to LED lights because they are an effective and durable lighting source. Although they are more expensive than other options like halogens and CFLs, an LED light bulb usually lasts longer than other varieties. If you want a bulb that will illuminate your light fixtures in San Jose for long periods of time, you might want to choose LED bulbs. LED lights are energy efficient and they can be dimmed to create a unique effect throughout your home. You can also find LED bulbs in a variety of sizes so you can fit them into a wide range of light fixtures. People tend to choose halogen lights because they remind them of incandescent bulbs of the past. These light bulbs do not bring a lot of value, however, and they tend to burn out faster than other options. If you want to get more value from your home lighting, you should probably focus your search on LED or CFL light fixtures. Since CFL lights have already been on the market for a while, they offer good lighting features and have a pretty long lifespan. CFL lights sometimes seem dull, however, especially when compared to newer options like LED lights. They cannot be dimmed, which means they are not good options in rooms where you might want to create a mood. 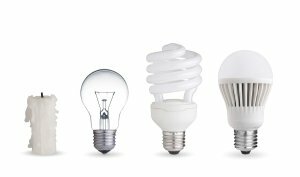 Just like LED bulbs, though, CFL lights use 75-80 percent fewer watts than incandescent bulbs that are otherwise comparable. If you want to get the most for your money, you should probably choose LED bulbs for your interior and exterior light fixtures. Hey we’re always excited to hear from our happy customers! If you’ve had a positive experience with us then review us on our Google Plus page! LEDs are the latest trend in home lighting. Not only are LED bulbs energy efficient, but they offer a wider array of colors and dimming capabilities than standard incandescent bulbs. To learn more about the latest developments in LED lighting technology, watch this short video clip. As you will learn here, the best way to decide if LED lighting is right for you is to visit a lighting showroom in your area and see and experience LED lights in person. To learn how you can incorporate LED lighting in your home, visit a home lighting showroom in San Jose. Whether you’re looking for decorative light fixtures or energy-efficient lighting solutions, a home lighting supplier will give you the professional advice and insights needed to make the smart choice for your home’s lighting design. You can look at specs all day long, but what matters most when shopping for home light fixtures is what your eyes see and what appeals to you. That’s why if you’re in the market for new lighting you visit Wright Lighting’s light lab , a fully functional space dedicated to demonstrating the differences in lighting and how different lighting affects cabinets, granite, and paint colors. If you’re remodeling any room in your home, don’t invest in materials and paint only to have your contractor install poor quality lighting that completely changes the look. You can bring your sample pieces to the light lab in San Jose to see how different lighting affects them and to find the right light fixtures for your home. When some people think about how to make their San Jose homes more energy efficient, they think of replacing large appliances, such as the refrigerator or the washing machine. While these improvements can certainly make your home a greener place, there are also small changes you can make that will benefit the environment and your wallet. LED light bulbs last significantly longer than other bulb options, and will cost you less to operate in the long run. Using LED bulbs in your light fixtures will also help keep your home cooler, as they do not waste energy as heat. Check out this infographic from the experts in lighting fixtures near San Jose to see more about the benefits of LED light bulbs. Please share with your friends and family, and get started with lighting your home more efficiently. If you want to save energy at home, a simple and cheap way to start is by changing out your old fluorescent light bulbs with energy-efficient LEDs. With LED lighting options, you can receive the same amount of light as conventional lighting technologies while using up to 90 percent less energy. This means you can save hundreds of dollars over the life of each bulb, which will more than cover the cost of the bulbs and any LED light fixture installation . Here are some important things to know about LED lighting. LEDs require only a fraction of the energy needed to illuminate traditional incandescent bulbs. 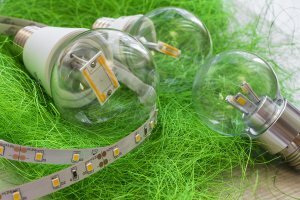 Not only do LED bulbs require less energy , but they also have a remarkably long lifespan. According to the U.S. Department of Energy, a 12-watt LED has a bulb life of 25,000 hours. Compare that with a bulb life of only 1,000 hours for a 60-watt incandescent bulb and you can begin to realize the potential long-term savings by switching to LED lighting. LEDs emit light in a specific direction, reducing the need for reflectors and diffusers. With other types of lighting, the light must be reflected to the desired direction. Unfortunately, more than half of the light may never leave the fixture. Not only is this incredibly inefficient, but it can also lead to poor lighting. Another benefit of LED lighting is that it emits very little heat. This means LED lighting is ideal for reading lamps, bathroom lights, and other close lighting fixtures where heat would be a problem. LED replacement bulbs can replace 40-, 60-, and even 75-watt incandescent bulbs. You can also find LED products at your local San Jose home lighting showroom that are specially designed to take advantage of LED light benefits. Kitchen under-cabinet lighting, for example, can transform your kitchen into a dramatic space. Recessed LED downlights are also popular light fixtures, commonly used in kitchens, hallways, and bathrooms.